As most of my readers know by now mommy and I are big advocates of reading and I have an extensive library for someone so little but mommy says that even though I may not know how to actually read it's great to start reading before I do know how. I've been read to for as long as I can remember and my first book was Goodnight Moon which is still one of my favorite bedtime book. Reading not only helps with my vocabulary but it introduces a whole new world to me. Speaking about bedtime, I had a nightlight that was not strong enough for mommy to see to read to me my bedtime story so mommy would usually turn on my lamp or sometimes even my overhead light which was so bright that once it was on I didn't want to go to sleep after that, so when Mobi Technologies Inc. sent me their AnimaLamp I was ecstatic. Now I can read with a nightlight that was perfect for reading and was pretty to boot. If you're not a fan of monkeys there is a pink bunny and a giraffe for you to choose from. The AnimaLamp is portable which means that I can take my monkey with me anywhere. It does have an AC adapter but it comes with a built-in rechargeable battery so mommy can put the adapter away from me after all that's not something I should be playing with. The instructions stated that I needed to charge it for at least 6hrs before I used it to protect the battery life so that's what mommy did. Once fully charged it was ready for use and I couldn't wait to use it. It was very easy to use. There is an on/off button that is controlled fully by touch and I loved touching it and watching the light go on and off. The light is fully adjustable so if I didn't want it for reading I can turn it down. Mommy was able to do this by simply touching and holding the on button. I'm not a big fan of the dark so mommy used it as an extra nightlight instead of the one that is plugged into the outlet near my bed and with the easy adjustable brightness control she was able to set it to the right amount of light I would need if I ever decided to wake up. Since this is a LED nightlight it is cool to touch so you won't have to worry about getting your little hands burned by the light. Hooray for that because I like to touch everything. Mommy is going to demonstrate with a simple video she took. She decided to do it while I was sleeping and here I was thinking this was supposed to be my review. I wanted to show how it was done. Bad mommy! It stated that the rechargeable battery will last 4 to 10 hours depending on the brightness level and when it begins to dim to recharge for 4 hours to return it to it's normal operating levels. We can say that this was true. I was able to sleep for about 8 hours with no problem and with it working. Mommy just simply plugged it in and it was just like new again. The Mobi AnimaLamp is perfect for bedtime reading and as a nightlight for your little one and gets my Two Tiny Thumbs Up! You can connect with Mobi Technologies via their Website, Facebook, Pinterest and Twitter pages. But wait! My review isn't finished. Once again the kind people of Mobi Technologies has decided to give one of my reader their very own Mobi AnimaLamp of their choice. Giveaway is open to US residents and will be randomly chosen by PunchTab. Winner will have 48hrs to respond to the email sent from PunchTabl or a new winner will be announced. Giveaway prize is sponsored and will be delivered by Mobi Technologies. Good luck! I love how you can adjust the brightness of the light! I love the rechargeable battery and the cool-to-the-touch LED light! This would be the perfect gift for my friend's 2-year old. She'll be having her 2nd baby in December and I'd like to get her 1st-born something so he doesn't feel left out. Is it weird that I want one for myself? I'm actually afraid of the pitch dark, which is strange for an adult. I'd probably give this to my kids' room and I'd steal one of their cool nightlights for me. How cool! I soo need to get Emalee one of these! I love the rechargeable batteries and LED light features. This would be great for reading to my 4yr old since her nightlight needs to be plugged in and there's no outlet close enough for us to see. I usually have to keep the hall light on to read to her. Thanks for sharing! I love that the light dims! I had a dimmer light when I was a kid and I loved it! I love that the battery can be recharged. I love that this is rechargeable and dims! Genious! Loving the rechargeable batteries too. This would be perfect for us! That's a great product! And really nice that it doesn't get hot! That is really really neat. It'd even work for someone Brady's age. Pretty good! The light seems pretty bright too! Love that it is cool to the touch! Cute lamp! I never used a night light with my kids, but those lights can come in handy for some many other things. :) Have fun with your monkey! That is such a cute lamp! I'm glad that you love it. I like that you can dims the light. My favorite feature is that it is a MONKEY! 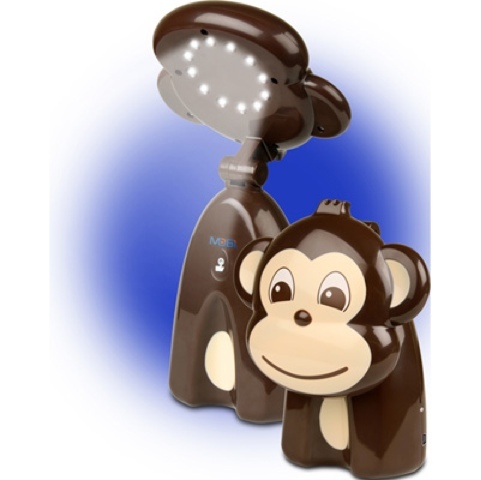 I have been looking for a monkey light for our oldest as she is monkey obsessed! I love that its rechargeable!!! I love all the Mobi products!!! That it has a rechargeable battery! I love that it comes with an AC adapter to charge it! that you can recharge it and that you can adjust the brightness. I love that the light is adjustable, it's LED so no burnt fingers, and that it has a rechargeable battery. We usually read downstairs before bed, but I like the idea of reading with them in their beds with just this lamp on. It'd be a nice transition. The rechargeable battery for sure! I love that it's rechargeable. I also love monkeys, they are so cute. My daughter would love this. My fave feature is just that it's so darn cute. The best feature is that my kids won't get burned by it. I know I should like the battery feature best, but I love that they are cute animals. My son and I love monkeys. I love that it is adjustable and stays cool to the touch.. but mostly because it's adorable! Love the rechargeable battery and the fact it stays cool to the touch. I like that the lamp is portable and I wouldn't have to worry about my kids unplugging it when they get up in the night (a habit my son has). It would also be perfect for bedtime stories! I love that it's rechargeable and portable! I like that it is rechargeable. I love that it will stay charged for as long as it does before recharging. That's incredible! I love that it has a rechargeable battery. I love that it is soo kid friendly I don;t have to fret about it getting too hot! I love that the battery is rechargeable. My favorite feature is that the battery is rechargeable and will last 4-10 hours. I love that the battery is rechargeable, since my daughter will only sleep with a light on in her bedroom. I love that it is rechargeable and that it uses LED bulbs! Thank-you for this awesome giveaway! The lamp is very cute and I love all the functions. This lamp is very cute and awesome.. I love the bright light features and and the other functions of the lamp. i love that is portable and rechargable. What a cute lamp! My girls would love this and I love that they cannot get burned! I love the dimming feature! Too bright of a light can keep little ones awake! This is so cute! I like that the battery lasts 8 to 10 hours and that the lights stays cool to the touch.